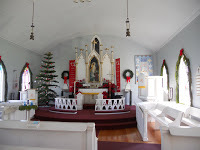 Lihue Lutheran Church on Kauai was founded June 1881 and is the oldest Lutheran church in Hawaii. The German immigrants who founded the church came to Kawai to work on a sugar plantation. Their voyage was six months and around Cape Hope. The church’s edifice was built in 1885 to replicate that of a ship which carried out the symbolism of the church as a ship. In 1982 Hurricane Iwa destroyed the building. It has since been lovingly rebuilt in the same architectural style. This Alaskan (Caroline) was practicing the organ in the balcony today when a tour group came through. The balcony is like the captain’s bridge. The acoustics in the sanctuary are outstanding. When on Kauai plan to visit and/or worship here. The sanctuary is open weekdays in the morning. Sunday worship services are at 8AM and 10:30AM. The Rev. Dr. Paul Kirchner is the pastor. If you have ever wondered what Bed and Breakfast owners do on their vacations, Caroline & Craig of Camai Bed and Breakfast visit Kauai where they find winter sunshine and renewal.